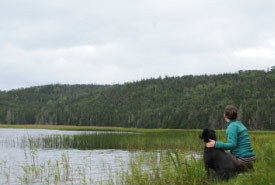 Located in the heart of the Avalon Peninsula, the Nature Conservancy of Canada's (NCC’s) Salmonier Nature Reserve is a collection of three properties, totalling 437 acres (177 hectares). The Salmonier area is special for a number of reasons. The forest itself makes up one of the smallest ecoregions in the province, and is unusual in a good way. A combination of the distinct landscape, underlying geology and moist climate create a great spot for a high diversity of lichens. Some of the lichens found in the area are unique on a global scale. Lichen studies on NCC’s Salmonier Nature Reserve confirmed the presence of boreal felt lichen — a globally rare species. Lichens might not seem important, but they have many uses: as food and nesting materials for animals, indicators of good air quality and even in some medicines. The Salmonier River is known, by locals and visitors alike, for its large runs of wild Atlantic salmon. By conserving the land along the river banks and uplands, we can protect the health of the river system so it can continue doing what it does well — hosting local wildlife as well as anglers from around the world. Hunting, fishing and access of historical ATV trails remain permitted on NCC lands in the Salmonier area. The Salmonier River Nature Reserve can be accessed from a small road off of Hwy 90, in Mount Carmel-Mitchells Brook-St. Catherines.